Step aside Mr. Jared S. Fogle. You too, Mr. Morgan Spurlock. Yes, there's no denying that Subway Jared's weight-loss regimen has propelled him to considerable fame and a very decent income stream. And Spurlock's successful film, SUPER SIZE ME, certainly gained both notoriety and, quite possibly, brought about a major policy change by the burgermeisters at the Golden Arches. But, as any self-respecting foodie knows, a good pu-pu platter has more than two enticing appetizers to choose from, and Needtovent welcomes the addition of a newcomer to the sub-genre known as "food for thought" films -- he's a gastronomical guru, a gangly Gerber goober named Brice Tea, aka THE BABY FOOD DUDE. On the surface THE BABY FOOD DUDE appears to be just a silly, lightweight comedy that is so stupid in places it makes the screenplay for DUMB AND DUMBER read like the Magna Carter. But, surprisingly, there's some real "meat" (for lack of a better word) to this low-budget, light-hearted indie production that on the surface appears to be nothing more than lightweight fare for the faculty impaired. Mr. Tea, however, is anything but a lightweight, at least at the beginning of what becomes a grand experiment. You see, Mr. Tea is determined to lose weight and so he tries a bizarre method that, honestly, only someone with a slightly demented mind could conceive -- that being a baby food-only diet for 40 days and 40 nights. Biblical? No. Umbilical? Maybe. And it certainly seems like an immensely immature, impulsive, implausible, impractical, imprudent, even imbecilic way to loose weight. But it is not immoral, as this film has nothing to do whatsoever with Russ Meyer's THE IMMORAL MR. TEAS -- a must-see film with enough eye candy to even satiate Mr. Peepers. Accompanying Mr. Tea on his journey from Texas to Los Angeles, to San Francisco, to Las Vegas to New Orleans and back is his real brother, Herb Tea, who plays a quasi-retard whose addled outlook on life provides, on several occasions, surprising insight. In addition, a fellow musician named Boogie tags along until he's unceremoniously left behind to fend for himself. With his abandonment, Brice and Herb find several willing drummers along the way who join in the outrageous ditties played by their band, the "Cool Arrows." (When saying the band's name out loud Spanish-speaking citizens will surely get a laugh...) As for the staff at Needtovent, the Cool Arrows remind us of our favorite Texas ensemble -- the World's Most Politically Incorrect Band -- Feo Y Loco. Dr. Demento and all Feoheads everywhere will appreciate these moronic musicians and their music which, despite the absurd lyrics, is quite catchy and appropriate for the siblings' shenanigans. For a very low-budget effort, special mention must go to the excellent outdoor cinematography. The various scenes of Brice spooning out a baby food bottle in front of the Grand Canyon and the Golden Gate Bridge, in particular, are stunning. Believe it or not, but the same holds true for some of the forground shots of Brice atop the porcelain throne attached to the back of the brothers' bus. (Apparently the one down side of an all baby food diet is a devilish case of diarrhea. I do believe Mr. Tea could have posed for Auguste Rodin were he still alive). Other kudos must go to Troy Gunther's droll narration and to Rose Lee Tea who poignantly portrays a mother's trying, but loving acceptance of her children who have yet to grow up. This is a very special performance, indeed. 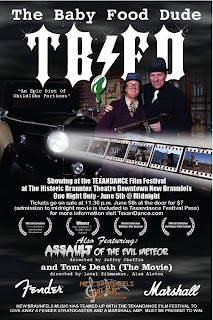 THE BABY FOOD DUDE will be screened at the historic Brauntex Theater in Downtown New Braunfels, Texas during the Texandance International Film Festival on Friday, June 5th at 11:30 p.m. We can't think of a better way to spend seven bucks. After all, wouldn't you like to meet meet Mr. Tea -- the non compos mentis filmmaker extraordinaire? More information regarding this film can be found at www.thebabyfooddude.com.